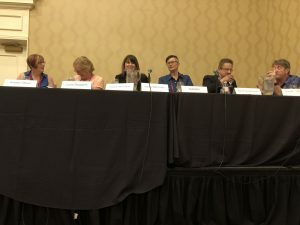 At the World Mystery Convention (known as Bouchercon), I appeared on a panel about writing in multiple genres. I had been really excited about this assignment, since I “peanut-butter” myself across almost all genres, and it was a good time. I believe the audience was entertained and informed. (left to right) Karen E. Olson, Carla Neggers, Victoria Helen Stone, Isabella, myself, and Kieran Shea.